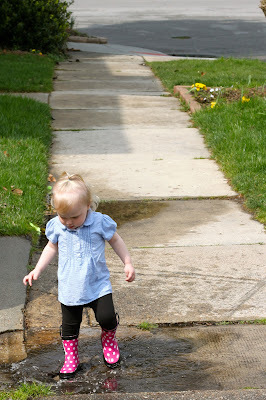 Rainy, gloomy days like today are the absolute pits in the spring time when all you want to do is go outside and play. But with a toddler, there is some fun that comes after the rainy days. Someone is pretty obsessed with "Mimmie" right now, so when I caved and bought something with a character on it for her - I was happy to have it be these boots. I was even happier when I saw how much fun she had with them. ...and the only trick now that she knows how fun this is, is to keep her out of puddles when not wearing her boots. Ha!